Growing up in Kentucky in the 60's, no one talked about reading food and product labels. The post WWll era had ushered in the high-speed age of American consumerism. Prepared food was considered innovative and fast food chains like Kentucky Fried Chicken and McDonalds were viewed as a novelty and a treat when my parents took us there. I grew up on a steady diet of TV dinners, Big Macs, blueberry pancakes from Perkins, and apple fritters from Dixie Cream Donuts. Toxins and harmful preservatives were not a part of my daily conversation. Bugles, Fritos and Cheetos were my favorite study snacks, washed down with Mountain Dew or Dr. Pepper after laying out in the sun using a metal refractor, slathered in baby oil tainted iodine to enhance my tan instead of sunscreen. No one worried about the ozone layer or the damage the sun might cause. We swam in chlorine-filled pools and had a sugar-filled Snickers bar as a treat after. While I wouldn't trade those toxin filled and processed food years for anything, times change and so have my concerns about my diet and that of my family. I read labels on everything I consume and I can honestly say that my children have rarely eaten processed or fast food. In fact my children's taste buds are so trained to crave healthy, plant-based options that Katie, my youngest, at two years of age, once spit out her McDonald nuggets during a surprise visit with a friend's Mom, bluntly stating that they were not like the "real" nuggets we had at home. Being the label reading, conscious consumer that I have become, in our house I only served Morning Star nuggets which are made of tofu. It's one of my biggest challenges as a mother to find healthy options and not feel like I've deprived anyone's childhood of special treats. I'm always searching the grocery store for the healthiest and best tasting options I can find. In fact, cruising the aisles of Whole Foods on the prowl for healthy snack food my teenagers will love the taste of and I will be happy with it's nutritional value is one of my favorite pastimes. So I was most delighted when I discovered Beanfields Bean and Rice chips. 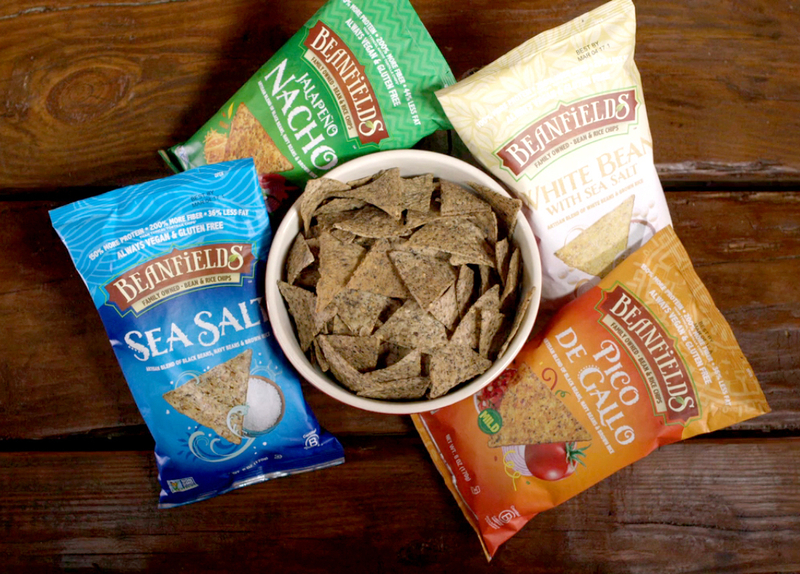 Beanfields, a family-owned certified B Corp, set out to create plant-based, Non-GMO tortilla chips that tasted good without using corn in 2010. They wanted to substitute that with an ingredient that promoted health, sustainability and ethical business practices - all of which are core to their values. After much researching on the part of Reed Glidden, the president and founder, his wife and co-founder, Liza Braude-Glidden made the first batch of tortilla chips using beans and rice instead of corn. Corn has a high glycemic index and is more likely to be genetically modified while beans are one of America's superfoods. Beans are the most water-efficient source of protein available. Bean crop production lowers agriculture's greenhouse emission. The USDA lists beans as both a vegetable and a source of protein. Plant-based diets help the environment. All of this fits into the Beanfields vision of using business as a force of good and what they call their guiding philosophy, kinder prosperity. I have become a Beanfields junkie. One of the many things I love about these chips, which now come in ten yummy flavors including Nacho, Ranch and Barbecue, is that they are certified gluten-free, Non-GMO Project Verified, vegan and allergy-friendly. But what is equally important in my house is that they taste so good you forget it's a better-for-you snack. They have become a staple in my kitchen, where I offer big bowls of the chips to my children and their friends along with great piles of guacamole. I also consider myself an underground distributor, encouraging all my favorite sandwich shops to keep them in stock. You can read more about Beanfields and how the Glidden family is revolutionizing the chip market with healthy and good tasting options here. I invite you to give them a taste and let me know what you think.